Set out two 12-cup cupcake tins with cupcake liners. In a big mixing bowl, cream the butter until it is smooth. Add the sugar gradually and beat until the mixture is fluffy and light in color. Add the dry ingredients (including the spices) in three parts, alternating with the milk. Spoon the batter into the cupcake liners! Each one should be about 3/4 full. Bake for 20 minutes (or until a cake tester comes out clean). 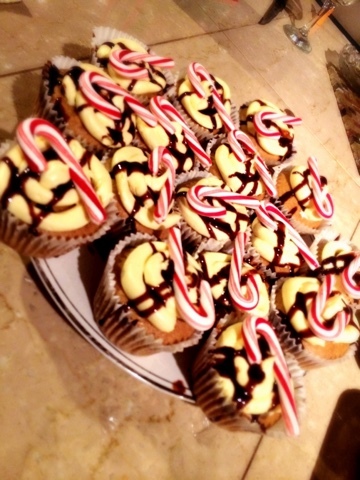 Ice your cupcakes with vanilla buttercream, and top with chocolate ganache and candy canes. looks delish will try ! !